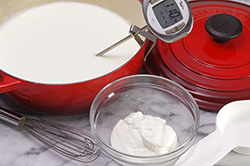 Making your own yogurt couldn’t be easier! Just two ingredients and time makes it happen. Start with a quart of milk, and add some starter cultures. 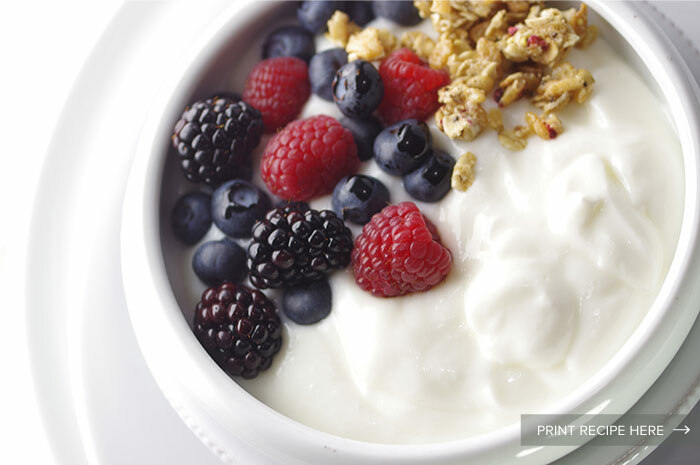 Keep at a warm temperature for 8-12 hours and delicious yogurt will meet you on the other side. 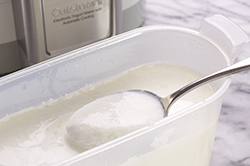 The active cultures in the starter yogurt multiply during the incubation period transforming the milk (skim, 2%, or whole) into thick, tangy yogurt. From this basic recipe for yogurt, so many serving presentations and other recipes are possible. Master this fermentation process and you’ll be healthy, wealthy, and wise! 1. 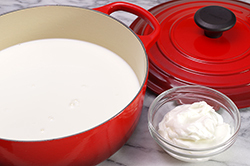 In a 2-3 quart enameled cast iron pot, slowly bring the milk to 180°F – not quite a boil. Leave at this temperature over low heat for about 10 minutes. This eliminates any bacteria that might be present in the milk and that otherwise might compete with the yogurt culture development. (This is less of an issue when using pasteurized, store-bought milk.) Allow the milk to cool to 110°F. Remove any “skin” that may have formed on top of the milk. 2. Mix the yogurt culture into the warm milk with a tempering process. Tempering the yogurt culture gradually warms the starter without shocking the active bacteria. More specifically, choose a plain yogurt whose packaging distinctly notes “Active Cultures.” In a 1-quart bowl, place the starter yogurt. 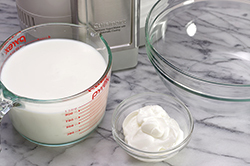 Scoop about 1/2-cup of the warm milk (110°F) from the larger pot and gradually whisk into the yogurt starter culture. 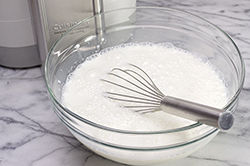 Continue to add warm milk in 1/2-cup increments three or four more times whisking to combine each time. 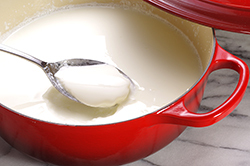 Transfer the warmed yogurt culture to the pot of warm milk; whisk to combine evenly. 3. Allow the inoculated milk to set in the pot in a warm place for 8-12 hours undisturbed. 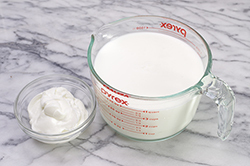 The yogurt is complete when the milk is thickened, but prior to the milk and whey (watery component) separating. Transfer to an airtight storage container, or individual containers and chill until ready to eat. Tips: Keep the milk mixture warm during fermentation. 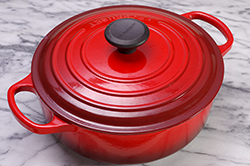 Using an enameled cast iron pot or stoneware pot provides natural insulation and temperature retention. 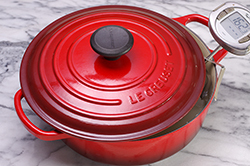 Place the pot in the oven of a gas oven; the pilot light will promote an ideal environment. Or, wrap the pot in a towel and place in an electric or gas oven that’s “off.” Or, place the wrapped pot in a microwave oven. Just ensure that you will not need the oven or microwave during the fermentation period. 1. 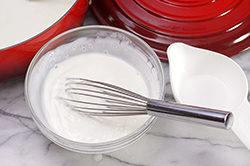 Whisk the milk and yogurt together. Pour into the fermenting container and set the timer for about 10 hours (+/- 2hours). 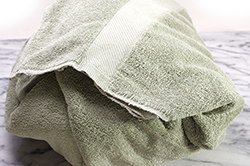 Leave undisturbed during the incubation time. The yogurt maker provides the ideal warming temperature for fermentation. If the machine has a cooling feature, it will automatically shift to a chilling mode at the end of fermentation. 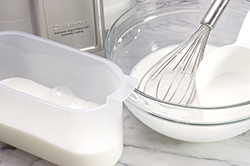 Transfer the chilled yogurt to the refrigerator at any point during the chilling process. If the machine does not have cooling feature, transfer the warm yogurt to storage container(s) and chill in the refrigerator until ready to eat.